(Medeshi) - The autonomous region of Somaliland is angling to become a trade and transit hub for East Africa, pouring millions of dollars into infrastructural development with the help of international financiers. But its plans are complicated by its ties to Somalia's capital city of Mogadishu. Though Somaliland has long functioned as a “de facto autonomous state,” the international community nominally recognizes it as a territory of Somalia, which endured two decades of civil war, famine and poverty before implementing a new constitution and national government last year. 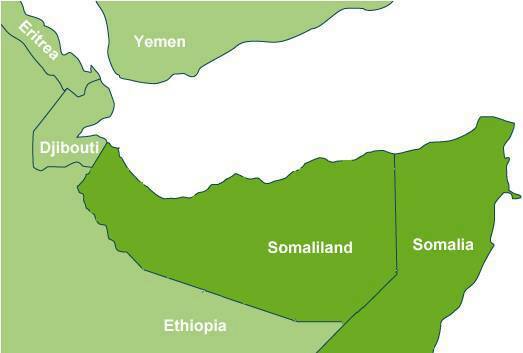 Somaliland, a region with a population of 4 million located in Somalia's northwest (bordering Ethiopia and Djibouti), has long been petitioning for formal independence. Somaliland has its own government, constitution, currency and economic ambitions. A newly reopened airport in Somaliland's capital city of Hargeisa is being touted by officials as a step in the right direction. Egal International Airport was badly damaged in the 1991 civil war with Mogadishu following Somaliland's self-declaration of independence, but a fresh round of refurbishments worth about $10 million began on 2012, mostly funded by Kuwait. Last month, the airport reopened amid great fanfare, and Hargeisa authorities are hoping to attract more international traffic to the facility. They're particularly focused on Ethiopian Airlines, Africa's fastest-growing carrier, whose central hub in Addis Ababa is about 365 miles (587 kilometers) away. "Airports are the gateways to the country," Mohamud Hashi Abdi, Hargeisa's minister of civil aviation said, according to the Somaliland Sun. "How they are built and modernized can lead to economic growth as well as regional integration." Somaliland already had a functioning airport at the port town of Berbera, which sits on the Gulf of Aden. Ethiopian Airlines begin operating daily flights there in July of last year. Somaliland authorities hope to convince carriers to include Hargeisa in their list of destinations, but more improvements may be necessary; pilots have complained that the runway is too short, and that shoddy perimeter fencing allows trespassers which could endanger landings and takeoffs. As Hargeisa pursues its ambitious goals, Berbera, too, is undergoing some major changes. But the port city will have to contend with neighboring Djibouti, a tiny country dominated by its capital city of the same name, which has already carved a niche for itself as the gateway to the Horn of Africa. Situated at the nexus of the Red Sea and the Gulf of Aden, which connects to the Arabian Sea and the Indian Ocean, Djibouti's bustling seaport serves as the primary import and export hub for landlocked Ethiopia, a fast-developing country of 93 million with a GDP of $43 billion last year, one of Africa's highest. Somaliland hopes to tap into Ethiopia's relative wealth by turning Berbera into a similar hub. Some Ethiopian trade already flows through the city, and total revenues from the port generate up to 80 percent of Somaliland's annual budget, which is at an all-time high of $125 million this year. But the government is keen to rake in even more. The demand is there; maritime traffic often overwhelms the Djibouti port, as it does at nearby ports like Mombasa, Kenya and Dar es Salaam, Tanzania. “The economic case for developing Somaliland is just mind-blowing -- [the] Berbera port is key,” James McCue, of the Berbera Development company said, according to the Financial Times. McCue, a British citizen who also serves as an envoy for Somaliland independence, is working to find investors to build up Berbera's infrastructure on land and at sea. For now, foreign investment is Somaliland's only hope for large-scale infrastructural development. Since it isn't formally recognized as an independent state, the territory can't receive direct aid from international donors. (Tens of millions of dollars do filter in annually to combat endemic poverty and food shortages, though the funds are administered by aid agencies and aren't recorded in government books.) Hargeisa is highly dependent on transport customs and domestic taxes, which many analysts argue has actually stabilized the region by keeping government authorities beholden to citizens and private businesses. Meanwhile, remittances from abroad have grown indispensable to citizens, since there are no commercial banks in Somaliland. Somalia, on the other hand, has leaned heavily on foreign aid since its new government was installed last year. At a conference in Brussels this week, international donors pledged $2.4 billion to help fund reconstruction in the war-torn country. Somaliland officials weren't in attendance. "We have declined to participate in a conference that fails to engage Somaliland as an equal partner and recognize the democratic choice of its people, and which wrongly gives the impression that the Government of Somalia has the right to make decisions about our territory," Ahmed Yusuf Elmi, spokesman for Somaliland's ministry of foreign affairs, said. While the territory pursues its political independence, ongoing development at Berbera and Hargeisa shows that economic independence is already a reality. While Mogadishu struggles toward political stability, Somaliland already has a head start in its ambitious bid to become the Horn of Africa's next big commerce hub.